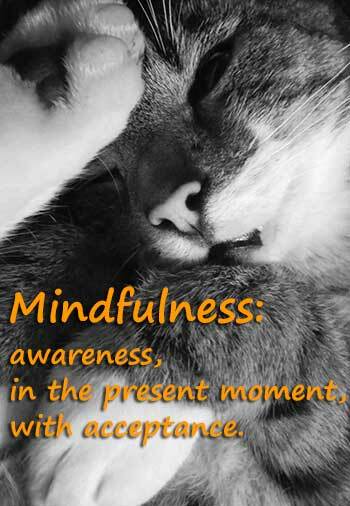 The practice of mindfulness brings us into present moment reality with acceptance of the moment as it is. We accept each breath as it arrives, be it short, long, deep or shallow. We observe it and let it go, releasing it on the out-breath. We accept the following breath as it comes, free of expectations. In the same way we observe physical sensations with as little judgement as possible. “Acceptance as we are speaking of it simply means that you have come around to a willingness to see things as they are.” ~ Jon Kabat-Zinn, Full Catastrophe Living. When we give our full attention to what is happening now, without the usual storytelling and habitual judgments, we are accepting reality as it is. However, more often than not, our mind has wandered elsewhere or is occupied with thoughts about what is happening. In any given moment we can choose to accept our reality or resist it. It seems to be a natural impulse to want to change things, however slightly or dramatically. Or if we are happy in the moment we may fear losing it rather than staying with it as it unfolds. The present moment is dynamic, continuously evolving. When we practice mindfulness we notice our thoughts without engaging with them. Our thoughts may or may not be true, we observe them and decline the invitation to debate their veracity. It can be surprising just how much energy we can conserve when we accept the truth of our current reality. For example, if I am feeling unwell then I may as well accept it and not fight it, even if it is inconvenient. I can then choose an appropriate response and move into recovery. Similarly, if I try to make a pleasurable moment last longer I actually shorten it, as any efforts to prolong it takes me away from the current happy moment. I can still ensure that I make time for the people, activities or things that I know I enjoy, however short or long-lived they may be. Rather than wishing things were better or other than they are, we could be more productively engaged. Acceptance informs us of how we truly feel in any given moment, which can empower us to make decisions based on fact and not fiction. It also frees us to experience more of whatever is, as it is, right now, which is all we ever truly have.